Box Text: The Rebirth of a Legend... and a True Hero's Challenge. The Legend of Zelda: Ocarina of Time, considered by many to be the best adventure ever created, arrives on the Nintendo GameCube, faithfully reproduced and displayed in high resolution. 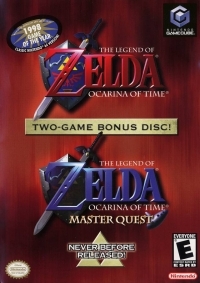 As a special bonus, this disc also contains the never-before-released Master Quest, a second journey through Ocarina of Time with newly laid-out - and incredibly challenging - dungeons. Only true heroes will make it through this quest alive. 09-07-2011 scott Box Text The Rebirth of a Legend... and a True Hero's Challenge. 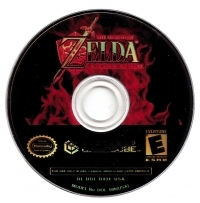 The Legend of Zelda: Ocarina of Time, considered by many to be the best adventure ever created, arrives on the Nintendo GameCube, faithfully reproduced and displayed in high resolution. 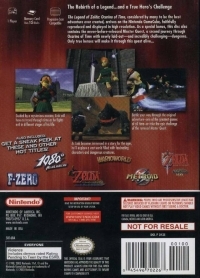 As a special bonus, this disc also contains the never-before-released Master Quest, a second journey through Ocarina of Time with newly laid-out - and incredibly challenging - dungeons. Only true heroes will make it through this quest alive. This is a list of VGCollect users who have Legend of Zelda, The: Ocarina of Time / Master Quest in their Collection.